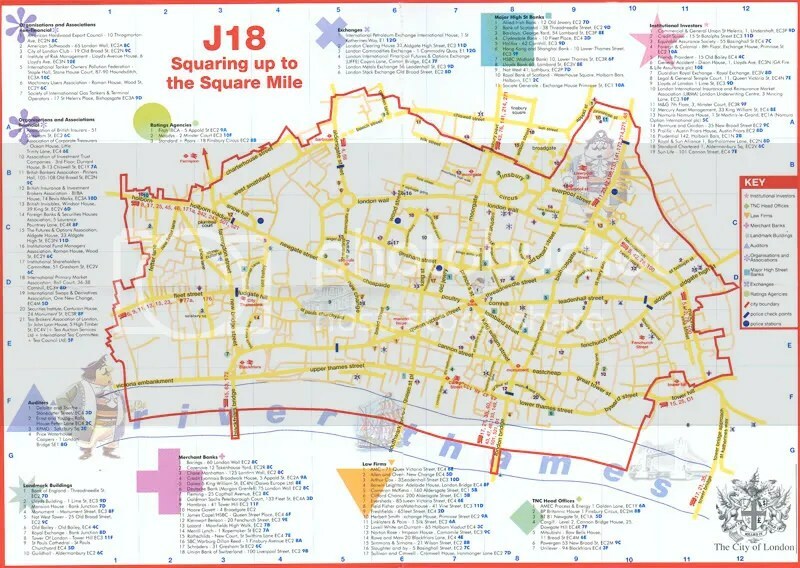 It’s worth pointing out that today it’s a decade ago that the international protests dubbed J18 against the G8 meeting in Cologne took place in many cities around the world. I was in London at the time for the protest there, organised by Reclaim The Streets, which was a pivotal point in the development of a possible revolutionary movement in the UK. What seemed to be a peak and the start of something new would soon decline and be suppressed. Arriving at Liverpool Street Station we were hanging out outside with more and more people arriving. The police seemed to think that the plan was to try and get a sound system into Liverpool Street and hold a party there. I remember one officer self-assuredly saying into his walkie-talkie “they’re not getting a sound system in here”. However that was not the plan at all. In fact not very many people seemed to know what was supposed to happen that day, us included. 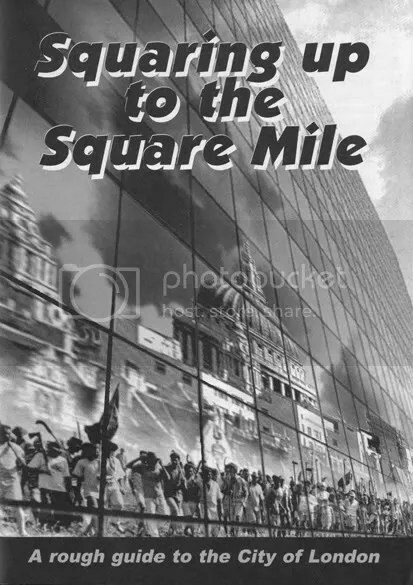 RTS had published and distributed extensively before the protest a spoof of the Evening Standard edition – called Evading Standards – as well as a guide to the City called “Squaring up to the Spare Mile”, which including a map that detailed the headquarters of various businesses and institutions. These were supposed to give an agitational and theoretical framework to the “Carnival Against Capitalism”. Tens of thousands of leaflets and posters had also been distributed. Later we got separated in the troubles and yet bumped into each other again in the course of the day. When the different streams of the demonstration re-congregated again and started partying to a sound system that had been placed – unknown to the police who had been completely outmanoevered by the unconventional logistics of the action – in a different part of the city, the same police reacted with unmitigated aggression. The result was a trail of destruction from the city towards Trafalgar Square. In the meantime an attempt was made to communicate what was happening over the internet. In a small community based internet place near London Bridge there was an intense and hectic atmosphere, with new dispatches of video tapes arriving, being digitized and transmitted, then a relatively new thing but somewhat predicting the information wars being fought out in the context of what is happening in Iran right now. Of course with about 10-15’000 participants June 18 was not on the same scale of unrest. Nevertheless it was a hopeful and energizing event that was largely seen as a great success. I certainly had an excellent day. The authorities had been clearly outmanoevered, and very few people got nicked considering the scale of the event. But there was a bitter aftermath, which became evident at the November 30th actions in London, when many activists from the previous actions were identified and detained. So while the 1997 anti-election “Never Mind the Ballots” action seemed to signal a teaming up of the environmental movement, sound system culture and radical sections of the working class, J18 1999 in particular was meant to take that a step further by internationalizing these currents. However it had a problematic aspect to it as well: There was in general a tendency to focus on finance capital, rather than capitalist relations and their revolutionary overthow. The “heart of the beast” was located in the City, the financial centre of London. I do not think that the essence of the J18 protest was already dubious, it was a very multifaceted “Carnival against Capitalism”. 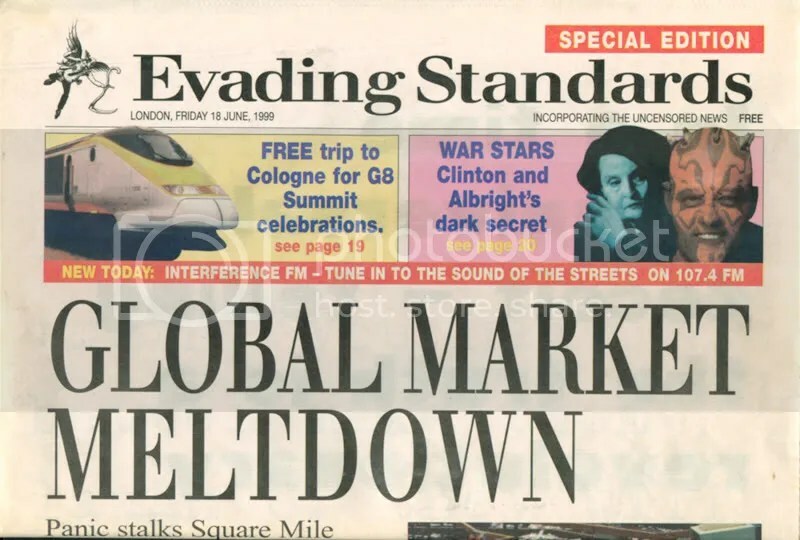 Nevertheless some grains of the negative development of the “anti-Globalisation” movement were already there: The focus on the evils of “Finance Capitalism,” rather than a clear communist perspective. This emphasis had been getting a lot worse in recent years, and could lead to a possible “red-brown-green” regressive anti-capitalist front. However the project of overthrowing the whole of capitalism was definitely present then, even though it was only manifested by a small minority of the population at the time.